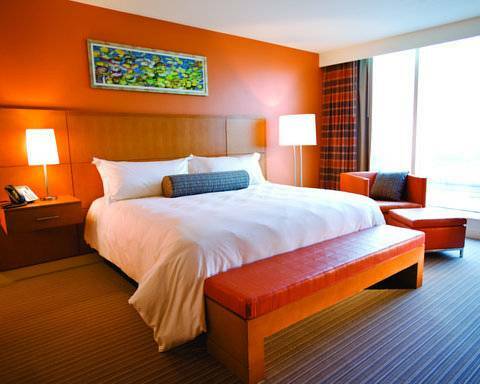 Greektown Casino Hotel is Detroits premier hotel for both the corporate and leisure traveler. An architecturally stunning 30-story - blue glass hotel located within walking distance of many national and global business headquarters. Rated as one of the top destination casino-hotels in Michigan. . Greektown Casino-Hotel is only 2 blocks from Ford Field - Home of Detroit Lions - 2 blocks from Comerica Park - Home of the Detroit Tigers and 3 blocks from the Theatre District. Only a short walk to Michigans largest convention center COBO HALL. Companies in walking distance of Greektown Casino-Hotel - General Motors - EDS - Deloitte - Ernst and Young - KPMG - Compuware - PriceWaterhouseCoopers - ATT and more. . Greektown Casino-Hotel is only a short 20 mile drive to Detroit Metropolitan Wayne County Airport. Located in the hart of downtown Detroits Historic Greentown district with over 25 area restaurants ranging from fine dining to casual and authentic Greek cuisine. Greektown has something for everyone. . At the new Greektown Casino-Hotel we pride ourselves on providing Superior Guest Service to all guests. Imagine a staff that welcomes you with exceptional courtesy and a desire to serve. This is the guest experience you will receive at Greektown Casino-Hotel. . Dine in anyone of our 3 new restaurants - Bistro 555 - The International Buffet or Alley Grill. Enjoy specialty cocktails in our cutting edge Eclipz Lounge. Gather with business associates or friends in our lobby lounge. . 10 meeting and banquet rooms that total over 10000 square feet make Greektown Casino-Hotel the ideal place to host your next event. . Our attached Casino features 100000 square feet of gaming space and offers the most exciting gaming experience around. Enjoy more then 3300 slots and video poker machines - 2nd largest poker room in the Midwest and more then 80 table games. Not to mention all your gaming fun is complimented by the friendliest staff our industry has to offer. Located in the hart of downtown Detroits Historic Greentown district with over 25 restaurants in walking distance. 20 mile drive to Detroit Metropolitan Wayne County Airport. And steps away from- General Motors - EDS - Deloitte - Ernst and Young - Compuware - PriceWaterhouseCoopers and more. . 2 blocks from Ford Field - Home of Detroit Lions and Comerica Park - Home of the Detroit Tigers. 3 blocks from the Theatre District and a short walk to Michigans largest convention center COBO HALL.